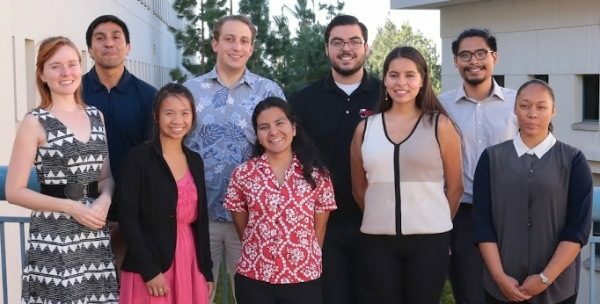 MARC graduating senior, Eric Gonzalez (Biochemistry) has received the highly competitive 2017 National Science Foundation (NSF) Graduate Research Fellowship Program (GRFP) award. Through a national competition, this program recognizes and support outstanding students who have a high potential in, and who want to pursue a research-based master’s or doctoral graduate degree. Of the 13,000 applicants who applied this year, 2,000 awardees were selected through the NSF peer review process. Applicants represented a wide range of scientific disciplines and came from all states. Eric was one of the 726 undergraduate seniors who received this award. We congratulate Eric for this great accomplishment and wish him continued success in the future. We also express our appreciation to his mentor, Dr. Christal Sohl, faculty in the Chemistry & Biochemistry Department, for her support and guidance provided to our MARC scholar. In addition, alumnus Carlos Nowotny (2014-2016), first year Ph.D. student at UCSF, received an Honorable Mention recognition from the NSF Graduate Research Fellowship Program.